Experience instant results with minimal-to-no downtime with the Spa Radiance Medical Thread Face Lift featuring NovaThreads®. Utilizing the latest technology, NovaThreads® are dissolvable Polydioxanone (PDO) threads made from the same dissolving material as surgical sutures. A thread lift is one of most effective ways to lift the sagging loose skin around the eyes, brow bone, cheeks, jowls and neck, giving back the youthful V-shaped face. 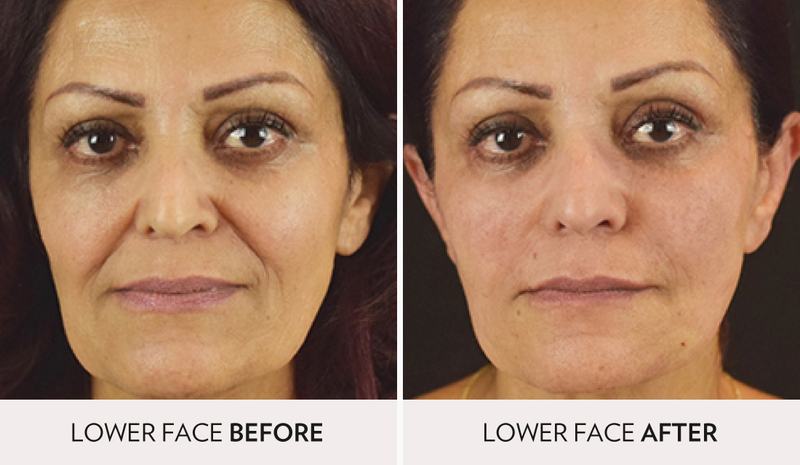 You can have a thread lift anywhere, even the body, but one of the most sought-after locations is the lower third of the face to counteract the sagging skin and marionette lines, naso-labial folds and laugh lines. The skilled nurses at Spa Radiance Medical look forward to personalizing your Thread Lift procedure based on your face shape, concerns, and ultimate goals. Avoid aspirin, non-steroidal anti-inflammatory medications, St. John’s Wort, and high doses of vitamin E supplements for 2 weeks before treatment. Avoid alcohol for 48 hours before treatment. LED light therapy is recommended post treatment to help reduce inflammation and minimize bruising. Avoid strenuous exercise for 72 hours. Avoid excessive amination of the face for 2 weeks before. Avoid massage and manipulation of the facial tissue for 2 weeks. Avoid aesthetic treatments including lasers, micro-needling, and any devices using electrical pulses such as micro-current, high frequency, and some at-home devices for 2 weeks. Until the initial redness and swelling have resolved, avoid exposure of the treated area to intense heat (sun lamp or sun bathing). Makeup can be worn immediately after treatment. Apply gently and avoid excessive rubbing or manipulation to the treatment area. Pigmentation change. Keep the area covered and use a sun block with an SPF30+, reapplying the sun block every two hours. Makeup can be applied immediately after treatment as long as skin is intact and there are no signs of blistering. We recommend Lycogel® to promote healing, provide sun protection, soothe the skin, and to rejuvenate and camouflage. NovaThreads are used as temporary filler that helps your body rebuild its own collagen. This means that the threads themselves will dissolve and therefore that initial lift from the treatment will likely fade as well. Then over the next 3-6 months, the collagen boost that your body created from the treatment should build recreating some of that lift naturally. We recommend scheduling a treatment follow-up for 2 weeks post treatment in order to address any concerns with the results. If you are completely satisfied with the outcome, you may cancel the follow-up appointment. Please keep in mind that we have a 48-hour cancellation policy. If after 3-6 months, you would like to further increase your collagen production for even more lift, we recommend having a consult to discuss another round of NovaThreads. NovaThreads are a synthetic absorbable surgical suture composed of polydioxanone, or PDO for short. PDO sutures are used to perform cardiothoracic surgery (such as open-heart surgery). It’s one of the safest materials to be implanted in the body, is fully absorbed in 4 to 6 months, and won’t leave you with any scar tissue. “Selective inflammatory response” is the principle behind a lot of aesthetic procedures (such as Fractional Laser, Chemical Peels & MicroNeedling) and NovaThreads is no different. Our skin is very good at repairing itself, and by inserting NovaThreads we make it ‘heal’ itself by creating new collagen, naturally! During the 4 to 6 months needed to fully absorb the PDO suture, your skin is also repairing itself around it— it’s “controlled healing” happening underneath the skin. Although NovaThreads can be inserted almost anywhere, one area where they are especially effective is the neck and jawline. The lower third of the face is challenging to treat effectively with botulinum toxin or injectable fillers, which are most effective in the upper and middle third of the face, respectively. With the ageing of tissues and the action of gravity, the natural lifting and shaping of our face diminishes or inverts. 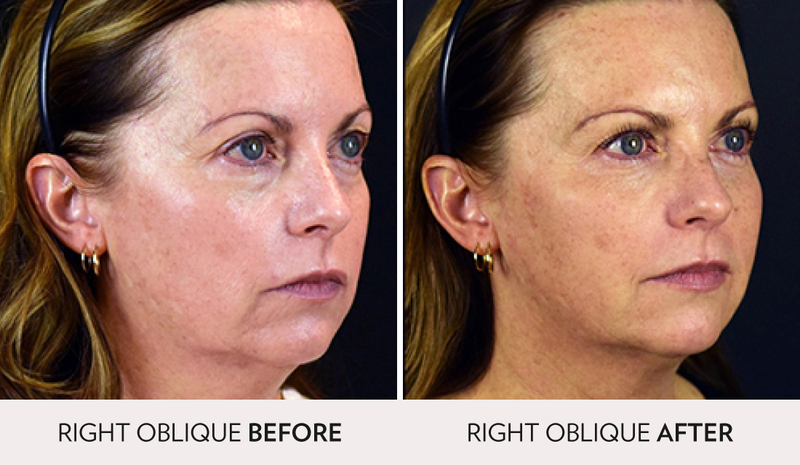 The idea behind the NovaMesh and the NovaLyft technique is to either create a scaffolding in order to support the tissues and keep a youthful shape, or where necessary, to delicately lift the tissues and reposition the skin to recreate shape where it’s been lost. There are two types of procedures using PDO sutures. The first one, called the NovaMesh, consists of creating a mesh under the skin (i.e. 2 sutures inserted vertically & 3 sutures horizontally), sort of like a #hashtag or a net. This mesh will serve as the foundation for your new collagen production. The NovaMesh tightens the skin naturally from within. Results appear naturally, without any drastic change. The other technique, called the NovaLyft is utilized to produce a more dramatic and immediate result. The PDO sutures have “barbs” or “cogs”, which provide a grip underneath the skin. Sutures are inserted the same way, except they can be pulled in 1 or 2 directions, creating an instant skin repositioning. Just like the NovaMesh, the skin will then build new collagen which will secure the lift! Effects should be noticeable immediately after treatment however maximum effect will occur in 4-6 weeks. Discomfort, or pain, at the insertion site is normal and may last several days to 2 weeks after treatment. Please contact us if the pain last longer than 2 weeks. Immediately after the treatment, bruising and swelling is normal and can be expected. A cold compress may be used immediately after treatment to help reduce swelling. These effects typically resolve with 2-3 days, but sometimes last longer. Asymmetry and irregularity of the tissues is common and will resolve on its own in approximately 2 weeks. Should you have concerns after the 2 weeks have past, please contact us for a follow-up.